I heard a crazy noise coming from the garage today. It was one of the Silkies trying to crow. It was a pathetic high pitched noise. However, something was different. The chickens all seemed scared and were huddled into a corner. Then, I saw what they feared. It was a tiny baby squirrel in the garage. 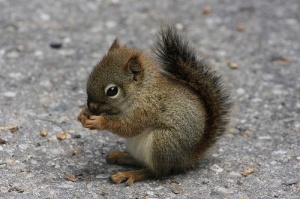 The poor little baby was only about 1/3 the size of a regular squirrel and lightning fast! As soon as it saw me, it scampered away under the lawn mower. I rolled the mower back about 10 feet and out sprang the squirrel. It ran over near the brooder and went behind it. The chicks were terrified. All the while, they were peeping and jumping all over the place, as I tried to capture this little squirrel. Nothing worked. It was hiding between the brooder and the wall. I tried waving it out with a broom. I tried using the yard stick, even the kids’ soccer net. All were of no use. Frustrated, I decided to leave the garage and it would just have to find it’s way out. I went on that day to mow the lawn and edge the flower beds. I had been away from the garage for about 2 hours. Surely, the squirrel must have found its way home. When I returned to the garage, I saw no sign of the little guy. I came inside the house and closed the garage door. I showered and then left to bring my daughter to swimming lessons and run some afternoon errands. Finally, after about 3 hours out, I returned home. As I was getting my daughter into the house, I heard a rustling noise in the garage, but assumed it was probably the chickens scratching. I went inside. When it was time to go out and empty the car, I noticed in my daughter’s bike helmet was the sleeping baby squirrel. When it saw me, the poor thing scurried underneath the garden tools and started growling. I think we were both scared. I turned my back for a minute to retrieve the broom and it was gone. Since the squirrel had been in the corner of the garage closest to the garage door, I assumed that it ran out. I closed the garage door and went back inside. I could not have been more wrong! About a half hour later, I opened the house door leading to the garage. My baby Silkie rooster was trying to crow again and I heard a commotion over near the garbage cans. I went back inside and grabbed my kitchen tongs. I returned to the garage and opened the outside garage door. I walked over to the garbage cans. I knelt down and could see a tail hiding behind a bucket. I grabbed the tail with the tongs. It escaped. Luckily this time, I blocked the escape route with a broom. Finally, I went for the little body with my tongs. Success!! I caught the little fellow. Terrified, the little guy bit the rubber on the tongs continually. I was glad it was not my hand. I walked into the yard and then released him. Strangely enough, he ran right for the chickens outside. He ran up the wired run. The big girls did not know what to think. They all stared at each other for a few moments and then the squirrel darted up over the top of the run and into the neighbor’s yard.